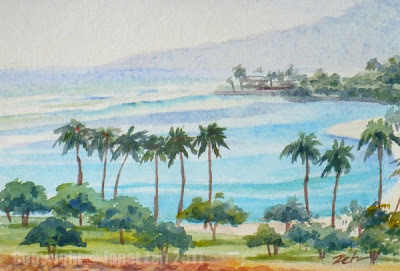 From the 11th floor lanai of the Ilikai Marina Condo, I had a beautiful view east and west along the south shore of Oahu. Depending upon which direction I faced, there was always something new to paint. This is the second time I painted this scene which includes portions of Ala Moana Park. It is painted on handmade paper so there is a lovely random textured effect in the far hills and sky. Because I was looking out on an early morning scene as I painted, colors and contrasts throughout the painting are muted and a mist envelopes the distant hills. Perhaps you can see a couple of people who were strolling on the beach.